2. Drizzle grape seed oil on a parchment-lined rimmed baking sheet. 4. Some pieces will not be fully filled with squash so I went in with a pairing knife and cut that part out to make all the rings hollow so that they cook evenly and also so that the filling fits. 5. Scoop out seeds and discard those. 6. Set squash rings on the prepared sheet and brush with more oil. Sprinkle some sea salt, pepper and thyme on top. 8. Remove from oven and fill with stuffing. (It should be ready by now). 1. Heat a large skillet to medium heat and add in the pine nuts. (Do not add oil to this, just straight onto a dry pan.) Toss gently around a few times as they toast up. Once they get a little toasted and aromatic, remove from the pan into a side bowl and set aside. 2. Drizzle grape seed oil into the same pan and sauté the onion until golden. 3. Add in buckwheat, lentils and spinach and cook for a few minutes until the ingredients get hot and the spinach wilts a bit. Do not overcook the spinach as it will loose color. 4. Add in the dried cranberries, balsamic vinaigrette and salt and pepper to taste. Remove from heat. 5. Scoop the filling into the freshly baked Acorn Squash rings. 6. 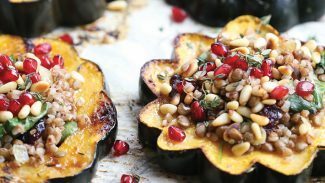 Top with toasted pine nuts, pomegranate arils and fresh thyme. Drizzle tops with extra balsamic vinaigrette if desired. 8. To serve, use a large flat spatula to lift these up so that the filling doesn’t fall out. Enjoy!